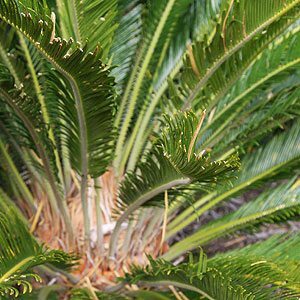 Cycas revoluta is commonly known as the ‘Sago Palm, one of the most widely used Cycads in landscaping and readily available from wholesale nurseries and growers. Being both frost and drought tolerant this is hardy adaptable plant. It will grow well from Tasmania,through Victoria and New South Wales to tropical Queensland as well as indoors. Fertilizer applied twice a year in early spring and again in summer seems adequate and watering should be regular however wait until the soil drys a little between watering. Outdoors in light shade they require little water once established. In general the cooler the climate the less water is required. Country of origin – Japan and nearby Islands. Position – Light shade to Full sun. Used in the garden border, grown in containers as a feature plant and also grown indoors in commercial buildings. Wholesale growers offer from small potted plants to large established specimens.